Sorry if this has been discussed a lot already, but I just got through seeing the whole story of Xenoblade 1, and now I'm wondering: How much (if at all) are we expecting this to be a direct sequel to Xenoblade 1? And how much do you want it to be? ends conclusively but leaves some hooks for a sequel, with various characters talking about venturing beyond the Bionis and Mechonis. However these are pretty vague hooks. , but the real question on my mind is if we'll see any returning characters. And who exactly would that be? Not many important characters survive outside of the main party, so I guess them? Maybe Alvis?
. Honestly, I'm expecting essentially no returning characters, though it's not what I hope for. The existence of common enemies and the overall look of the world gives it a direct sequel vibe than just being called Xenoblade 2. But we just have not much information yet as to how connected it is to the first one. As for the party members, I don't think any party members from the previous game will return as playable characters. The adventure is pretty much different from the first one. 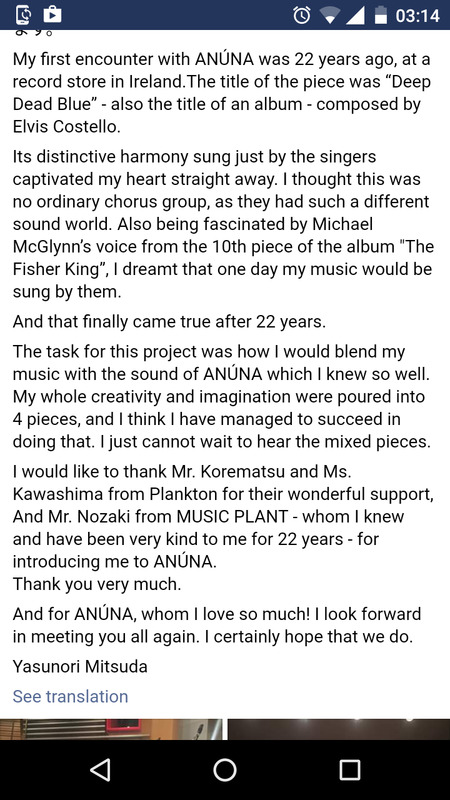 Mitsuda has spent the day recording tracks for Xenoblade 2 with Anuna, a Celtic/Irish choir. Incredible music. Absolutely out of this world. Mitsuda has spent the day recording tracks for Xenoblade 2 with Anuna, an Irish choir. WE'RE GOING TO FIGHT GOD AND WE'RE GOING TO LOVE EVERY BIT OF IT. Needless to say this is pretty cool and I'm expecting a top tier Mitsuda OST. Pretty sure OST is one of the later things that are done. Watch them turn this into Xenogears Episode I.
I want them to do this. Maybe even make it so Chronicles 1 was Ep 1 and this Ep 2. Wishful thinking, I know. Man, I really got to finish Xenoblade Chronicles. I put in over 100h then just kind of stopped without finishing it off. The soundtrack to any game is usually one of the last things to finalize. Why would you think this started on 3DS? The New 3DS can't even run the first Xenoblade without significant downgades. If anything, they're probably using the Xenoblade X engine largely unchanged. That's what I also think. The only reason we may see the finished game this year is because they reuse the engine of Xenoblade Chronicles X. If you look at the trailer for this game it's very obvious. Not that that's a bad thing. In this tweet Yasunori Mitsuda says the "Dreamy recording" is finished so he's kinda sad. The character designer of Xenoblade 2 talks about how Takahashi said : "It makes me have goosebumps" and he wonders if he was talking about the music (but it seems implied). People always take XenobladeX as a reference but I think it's not the best example. 1) The game was shown during the well known January 2013 direct which was obviously a panic direct. 3) The announced date was 2014, not 2013, so it was already shouting : "It's faaaaaar away from now !" Between January 2013 and December 2014 there's already 2 years. The delay to April 2015 in Japan didn't change much and was to e expected since the first reveal "year" was too far away to be that clear. Now I'm not saying it's impossible Xenoblade 2 gets delayed to early 2018, I actually think February 2018 is part of 2017 (as the last winter month). What I wonder though, is how the localisation is handled since 2017 is the same for everywhere. I'm personaly playing RPG in Japanese so I'm not waiting for it, but there's clearly a big difference in localisation involved this time around, or they are straight up lying. I'm also really interested in how the company managed each projects, whether it's directly their own game, or Zelda. True, but with XCX they did the soundtrack pretty early in the development process. I would anticipate at least a 6 month delay in localization. Nintendo doesn't seem to prioritize simultaneous worldwide releases for RPGs outside of Pokemon. Well that's only one part of it, we don't know if the rest of the sound tracks wasn't done a while before. It could be only a few tracks of Mitsuda which requires the participation of this group, finished later. Most if not all of the compostion was probably done and the composer could send samples of it while having to add some arrangement or something. I don't know, just trying to find a few possibilities. Ok then they just have to release the game in November for the western territories and 6 month before for Japan (lol). I'd like that. But we never know what change might happen. What if they deliberately postponed the Japanese release while the localisation does its job ? Just throwing whatever ideas... I certainly don't hope they would do that last thing I typed. Whilst true Kimishima said recently that they were going to be more focused on worldwide releases now and the new Fire Emblem is simultaneous(or close to it?). What does this even mean... jesus. Well Xenoblade 2 already has voice acting so either way we're good! Interesting stuff, he seems happy about this collaboration. Not to sound incredibly selfish, but I really hope that's the case. I don't really want to spend months and months hiding from the internet because of potential spoilers. I hope this "2017" release is part of Nintendo's new strategy of global launches. Maybe they've decided that localization should happen at the same time as development, despite the increase in costs. So is this a sign that the game might actually be coming out this year? Xenoblade X wait was brutal for me so I'm trying to temper my expectations on this one. no more X,Animu Xenoblade comes back baby! I've been saying it's going to come this year. Is Mitsuda going to do more than one track this time? He's already written four tracks with the Irish choir, Anuna. Now that the initial announcement info roundup is done, we don't need this thread (or any megathreads). If there is more information about this game, then create a new thread.